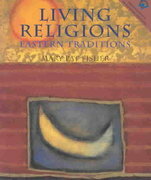 Living Religions - Eastern Traditions 1 Edition Living Religions—Eastern Traditions is a highly readable and stimulating survey of the major global religions and new religious movements that originated in the East, with particular focus on how people are trying to live by them in today's world. Evocative illustrations enhance this approach; first-person interviews of ordinary people and boxes uncovering the spiritual roots of well-known public figures bring this book to life. Covering the key religions of India, China, and Japan, the social context, origins, teachers, scriptures, and historical development of each faith are carefully explored, with emphasis on how practitioners themselves understand their tradition from inside. For readers interested in a comprehensive book about eastern religions, as well as the clergy of various faiths, and workers in corporations that trade in India, China, and Japan.